"Nothings going to change my world", sang John Lennon in the 1960's, but perhaps more than any other man of his time he embodied change. He was shaped by the winds of change and he helped make those changes. "The times they are a – changing," Sang Robert Zimmerman, a.k.a. Bob Dylan, and indeed changing they were and changing they are. But some of us try to preserve the way things are; we forget that no one can stop change. Yes, some things stay the same forever but some things change. The same sun rises everyday and sets every night, human nature is basically unchanged, love and hate, jealousy and fear; our emotions are the same as thousands of years ago. And man comes up with defense mechanisms. One of those remarkable developments has been the martial arts. From ancient Israel to Greece to Japan to modern Israel – the martial arts have developed and changed and adapted. What was considered perfection by one generation is considered obsolete by another. Bruce Lee came along and challenged the martial arts world with his "way of no way", "Use no way as the way". Royce Gracie came along with the "ultimate challenge" and changed the way this generation trains. A generation comes and a generation goes. Sadly, man does not seem to change very much; greed, power, jealousy and hatred remain, and we still have a need for self-defense, but the circumstances do change and our tactics and training must change as well. We cannot fight today's fight with yesterday's techniques. In Israel we have had a need for hand-to-hand combat since the very beginning. Our training is based on our reality. During the early years; 1930's, 40's and early 50's, the Arabs often attacked using sticks, axes, swords and blunt objects. The Jewish community did not have "live" weapons such as hand-guns or rifles. What they did have was sticks. The art of the stick developed. In Hebrew this was called Kapap, which stands for "Krav Panim mul Panim" (Face to Face Combat). The main focus of Kapap was use of various sticks. This suited the times very well. In the hands of a trained Kapap fighter the stick became a formidable weapon of self-defense. Older men have told me stories how they always took their sticks with them on hikes and trips. Often they would be confronted by hostile Arabs. 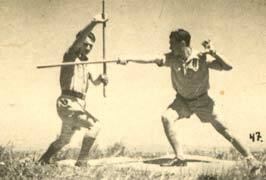 The stick proved effective in stopping attacks and in earning the respect of the local Arabs. The Jew had been known to the Arabs as the "Child of Death" because they had always seen the Jews as victims. Kapap and the stick helped change this perception and this reality. As the years went on the facts changed. Arab attacks took on different forms, Jews gained statehood and live weapons, and the use of the stick lost much of its significance on the street and in the field. Kapap came to an end. And yet it was difficult to give up the beloved art that had proved so successful. Like an old rifle that had proven itself in combat the soldier had difficulty accepting the "new and improved" rifle. The youth movements took it upon themselves to "preserve" the art of the stick and Kapap. But here lies a great martial truth: When one is only "preserving" an art but that art is no longer necessary for survival – it changes. The changed art is either more "stylistic" or simple a watered down version of the original art. Simply put – if your life depends upon these skills – then you train differently. Preservation of an art does not bring out the combat training that one needs for survival. That is why trying to learn real life combat from "fossilized" or "stylized" arts will never work. We cannot live in a museum, or in the past. We have a certain nostalgia towards the past; this is natural but this must not cloud our judgment for the present. The needs of the present must dictate our decisions. This was Bruce Lee's outcry against the martial arts establishment. He challenged it saying, "The king has no clothes." – The techniques are not real!! They are only formalized version of what once worked in combat, long ago and far away. Kapap training in the youth movements was a watered down version of the original arts used against Arabs. Manuals were written for the sake of preservation, not for survival. Gradually the art pretty much died out. It was replaced by an art that evolved from it; Krav Maga. No one is quite sure how the transition took place. For a while both terms were used interchangeably but by the early 1960's the name Kapap had pretty much fallen into disuse. Circumstances had changed. Attacks on Jews walking in the fields became less common. Methods of transportation and travel changed, more people live in the cities. Today we have other sorts of challenges and we must not deal with these using the techniques and weapons of the past. Things change, Times change and we must adapt if we wish to remain relevant; both in Krav Maga and in life. Too many instructors are teaching yesterday's Krav to today's students. Your old road is Rapidly aging'. For the times they are a-changin'."